Figure 33.2. (A) sFLC concentrations in 259 CLL patients. Red squares: CLL cases; blue diamonds: normal controls. (B) Time to first treatment for 257 CLL patients based on normal (n=157) or abnormal (n=100) κ/λ sFLC ratios (p=0.001). (C) Kaplan-Meier survival curves for 259 CLL patients based on normal (n=159) or abnormal (>1.65, n=66; <0.26, n=34) κ/λ sFLC ratios (p=0.001). (Reproduced with permission from the British Journal of Haematologyand John Wiley & Sons Ltd). Figure 33.3. (A) Time to first treatment and (B) overall survival of 339 newly diagnosed, untreated CLL patients according to sFLC abnormality. (This research was originally published in Blood © the American Society of Hematology). The concentrations of sFLCs observed in CLL patients are typically much lower than those found in multiple myeloma (Figure 33.2A), and are similar to patients with B-cell lymphomas (Chapter 31). 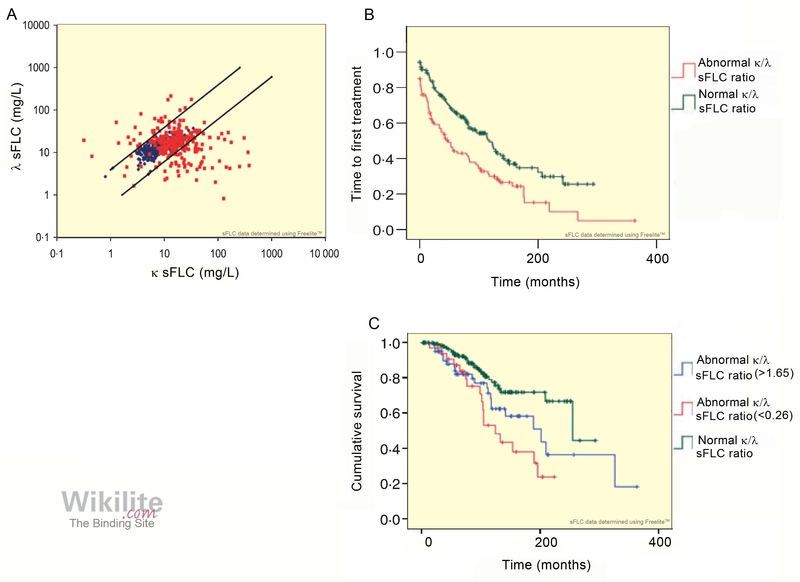 In a retrospective study of 259 CLL patients comprising 181 untreated/pre-treatment and 78 treated individuals, an abnormal κ/λ sFLC ratio was associated with shorter time to first treatment; median 48 months vs. 117 months for a normal ratio (p=0.001) (Figure 33.2B) . Patients were allocated to one of three groups based on their normal or abnormal κ/λ sFLC ratios (analysing abnormally high or low ratios separately). An abnormal sFLC ratio was prognostic for reduced overall survival (OS) from diagnosis (Figure 33.2). The sFLC ratio remained prognostic for OS when the groups of 181 untreated/pre-treatment patients were considered separately . Similar findings have been reported by Morabito et al. . On multivariate analysis, four independent prognostic variables for OS were identified: 1) κ/λ sFLC ratio (p=0.024); 2) β2-microglobulin concentration (p=0.01); 3) IGHV mutation status (p=0.017); and 4) ZAP-70 expression (p=0.0001) . Maurer et al. studied the prognostic value of monoclonal sFLC elevation, polyclonal sFLC elevation and ratio-only abnormality in a cohort of 339 newly diagnosed, untreated CLL patients. After a median follow-up of 47 months, 26% had been treated and 10% had died. All three sFLC abnormalities were associated with a reduced time to first treatment (Figure 33.3A). A monoclonal or polyclonal sFLC elevation was also associated with poor overall survival, compared with patients with normal sFLC concentrations (Figure 33.3). The group with monoclonal sFLC elevation had the worst prognosis, and was shown to have distinct clinical characteristics associated with more aggressive disease. These included a higher prevalence of high-risk biologic characteristics (CD38+, CD49d+, ZAP-70+, IGHV unmutated, and high-risk cytogenetic abnormalities) compared with patients with normal sFLC. Consistent with this finding, the most common cause of death in the monoclonal sFLC elevation group was progressive CLL. In contrast, most deaths in the polyclonal sFLC group were due to other causes, and the authors concluded that polyclonal FLC elevations may serve as a marker of host “fitness”.